After trying to pump up passenger anger against demonstrators since the non-protest on August 11th, such as in the BART-TV propaganda video here, veiled threats against protesters are now coming directly from BART. BART is apparently not only issuing the usual PR statements on its own behalf and/or vilifying nonviolent protesters, but the agency seems to have taken on a new role as the voice of the potentially violent counter-demonstrator as well, masked by a layer of faux concern for protester well being. "I worry somewhat about the protesters, because some people are pretty upset," BART deputy police chief Ben Fairow said Thursday. "We can’t control what they do." That's incredibly ironic and hypocritical of BART considering that the BART PR spokesperson Linton Johnson declared "zero tolerance" for nonviolent in-station protests in July, that BART has played the "passenger safety" card to the hilt in an effort to legally rationalize their shutdown of mobile phone antennas on August 11th, and that BART riot police arrested demonstrators for merely raising their voices on August 22nd. So, BART claims they "can’t control" what violent people do in their stations. Is that really the message the agency really wants to be sending out to the riding public? How about Charles Hill and Oscar Grant? Neither was a real threat to anyone but both were shot dead by BART police. And what about the dozens of riot police BART has been filling their stations with since August 11th? According to deputy chief Fairow, they are powerless to stop violently pugnacious people. Yet BART certainly seems determined to prove that they have absolute control over demonstrators. Their riot police have proven their eagerness to arrest people who dare to speak their minds about BART police brutality. Is this the only reason BART has a "Tactical Team," to silence dissent? 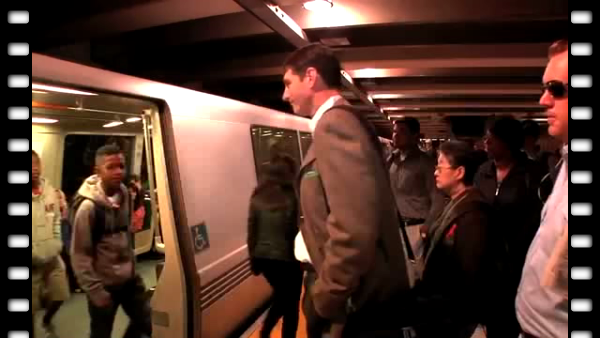 BART had no problem with a passenger yelling at protesters on the Civic Center platform on August 22nd. Why would the agency issue veiled threats to the media of impending, unstoppable beatings of BART critics by unstable or deranged passengers? It's becoming apparent that BART and its police not only approve of physical assaults against demonstrators but the agency is actively using the media to carry the message to the potentially violent authoritarians amongst us that BART has little interest in stopping them and most likely will continue to look the other way -- while their police instead busy themselves dragging away anyone who dares to chant "no justice, no peace, disband the BART police" inside a train station. Linton Johnson bemoaned "cyber thugs" after the hacking of two BART websites, and his fellow BART spokesperson Jim Allison more recently condemned the release of lewd digital photographs that Linton Johnson himself had irresponsibly posted online on Facebook and other public websites (irresponsible, considering his high-profile profession as BART's mouthpiece), but "muBARTek" appears to be informally ginning up its own cadre of real life thugs to rush into the square (er, platform) on BART's behalf, to do its dirty work. Hey, there's just nothing they can do to stop real violence, even in the presence of dozens of riot-clad BART police. BART would also have us believe that it's completely safe and appropriate to lock hundreds of passengers within an underground BART station with no notice in the middle of earthquake country, lest leafleters be able to destroy the minds of passengers by handing out fliers critical of Bay Area Rapid Transit's inept, reckless, and corrupt police force. But stopping an actual assault or holding a known attacker accountable? Out of the question. Remember all this next time you hear BART officials attempting to justify their anti-free speech or anti-protest behavior on the disingenuous premise of the agency caring oh so deeply about "passenger safety." SFPD and the corporate media are likewise beating the drum of "passenger backlash". San Francisco Police Chief Greg Suhr: "I don't want this to be construed as delivering a threat, but enough is enough. They made their point, and they are now losing in the court of public opinion." Note that the SFPD didn't bother to arrest a person who physically battered protesters on August 22nd. As reported by Bay Citizen, "One commuter turned violent later in the evening, rushing into the crowd of protesters at Civic Center, swinging his fists.... He was briefly detained by police, but let go when no one who’d been struck came forward." If no victim came forward after the August 22nd assault, then presumably SFPD must have seen the incident themselves since they knew who it was and were able to detain the assailant. If they didn't see it themselves, then there must have been citizen bystander who made SPDF aware of the incident, meaning there was at least one witness to the assault. And yet they let this truly violent person go. Do you think if a protester had punched even a single passenger, with or without a victim to testify, that SFPD (or BART PD) would not have pursued every charge at their disposal against that violent protester? The day after the protest, SFPD released the names of everyone arrested on a Grove Street sidewalk on August 22nd. Never mind the fierce police reaction to the release of BART police officer information by a hacker. And never mind that many if not most of those surrounded on the sidewalk had been following the street march on the sidewalk the entire time or that there were women who were rushed by police on the sidewalk and beaten with batons. As for the presumption of innocence, never mind that as well. Odds are that most if not all of the corporate media outlets that published the list of arrestees and their home towns for all the world to see, as if those arrested had already been proven guilty of some horrible crime against humanity, those same corporate outlets will do no follow-up reports after this coming Monday's arraignments on who amongst those arrested will be facing charges moving forward and who exactly had their charges completely dropped. The smear is already in on every last one of them. Job done.